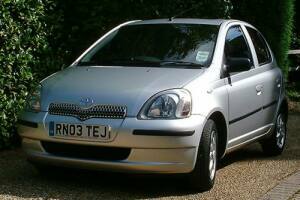 Description of car for sale : Toyota 2003 O3 Yaris CDX Manual petrol Silver £6,850 7,520 miles, "1.3VVT-I. Alloys,Aircon,Electric Mirrors,Cd-Player,Sunroof. Full Service History. Lady Owner - Returning To The US."